BlogHome Manufacturing Careers, Uncategorized Why Manufacturing is the Right Career Choice- Data! Why Manufacturing is the Right Career Choice- Data! Is now the right time for you to start your career in U.S. Manufacturing? I found this chart on Global Macro Monitor Blog on WordPress. They look at it for their purposes. Lets look at it for ours. I started my manufacturing career in September 1973, near the bottom of the “Nixon Decline.” It wasn’t easy- I had plenty of layoffs- but there was plenty of upside and I went from laborer in a sintering plant through a series of jobs to become, senior plant metallurgist, quality director, plant manager, division director for quality and technology. Being in the right place at the right time (manufacturing) from 1973 to 1977 allowed me to take advantage of the upside in manufacturing that gave me the momentum to grow my career. Looking at the chart above, 2012 looks like the exact same opportunity, only better. I speak and meet with precision machining company managers and owners daily. All are looking for people with skills and talent. All are investing in training for their proven performers. Our National Technical Conference last week had over 102 first time attendees. Twice as many companies offered internships as there were students in our first Right Skills Now class. 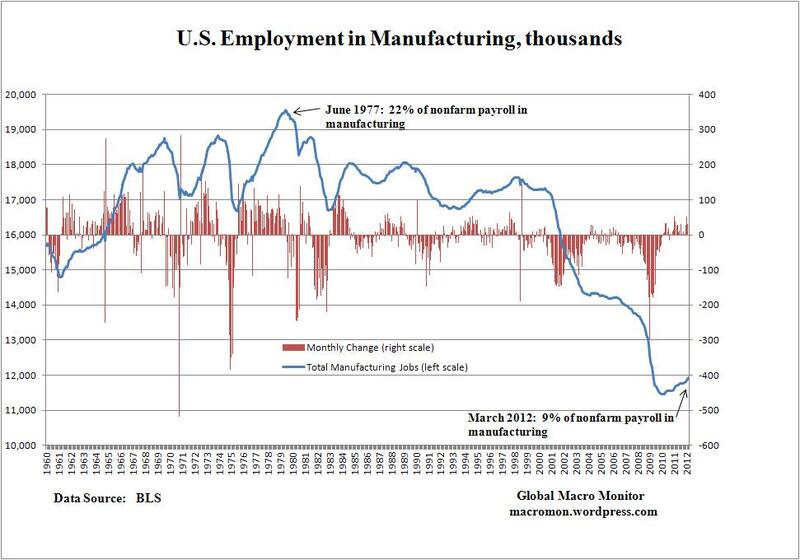 These are some very strong indicators that now is a great time to start a career in manufacturing. If you can do the math and solve problems based on your experiences, we’d love to have you in our precision machining industry. P.S. And even though I characterized it as the “Nixon Decline,” I am not at all holding any president responsible for these. There are far more important factors at play in this chart than whether or not there is a Donkey or an Elephant in the oval office. According to the Atlantic: "...overall unemployment is also still high for young B.A.'s. So fewer are working at all, and more are truly clinging to the bottom rungs of the job market." How Do I Get a Job In Precision Machining?